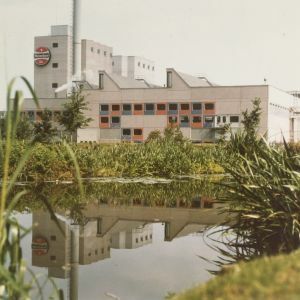 In 1971 Heineken acquired 80 hectares of land in the “Oude Groenendijkse” diked marsh, also known as the “Barrepolder”, in the municipality of Zoeterwoude. On this terrain a new brewery was built, replacing the old Heineken brewery in Rotterdam. In comparison, the Rotterdam brewery was built on 4 hectares. 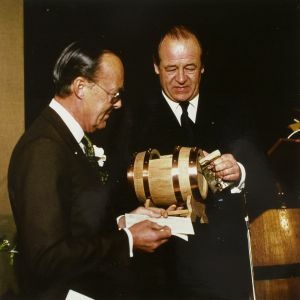 The official opening of the new brewery took place on April 18th 1975 and was attended, among others, by Prince Bernhard. 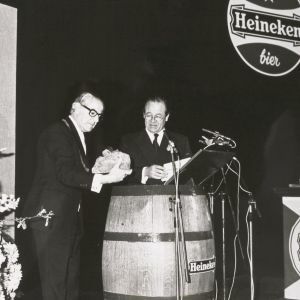 Alfred Heineken was the first person to give a speech, mentioning the following: “when we decided to build the new brewery, we envisioned a landscape of industrial buildings, spread out over a beautiful park, as opposed to one massive construction. In our opinion a well balanced ecological system was achieved by largely maintaining the existing ponds and plantings”. Alfred Heineken was right, and anyone that visits the brewery in Zoeterwoude will experience how this ‘open planning” from the 1970’s still feels spacious. A picturesque tributary stream of the Old Rijn river, called the “Weipoortse Vliet” runs through the middle of the brewery terrain. On February 28th 1973 the first tree, a sweet may cherry, was planted, after which a thousand other trees were planted along with forty two thousand bushes, among which hop plants. “Green” proved to be no empty slogan for Heineken. 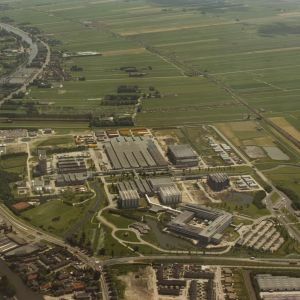 In his speech, Heineken also discussed the history of the “Barrepolder compound”, as the brewery terrain was called at the time; “The history of this diked marsh dates back to many centuries ago. The remainders of the fundaments of a castle with the name ‘Zwieten’ can still be found on this terrain. It dates back to 1321 and the castle-moat is still in tact. Legend has it that there is a golden crib recessed in the castle-moat. People would pay the farmer who owned the terrain a dime for permission to dig around for this treasure. We also acquired these rights, but it costs us significantly more”. 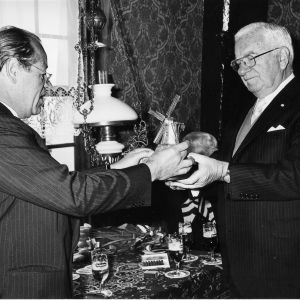 To reinforce good relationships with the community, Heineken presented the mayor of Zoeterwoude with a miniature golden crib. “Huis te Zwieten’s” moat can still be found in the green, when visiting the terrain. It was strategically located close to where the “Weipoortse Vliet”, called “Swet” (the traditional Frisian word for sweet) at the time, flowed into the Old Rijn. The castle is mentioned as early as 1321 and was a home to the van Zwieten family for centuries. The Spaniards destroyed the castle during the occupation of Leiden, but it was rebuilt and in 1632 it became property of the mayoral Bicker family of Amsterdam. At the end of the 18th century the house was abandoned and finally demolished in 1805. Another special element that can be found on the brewery terrain is a mill called the “Barremolen”. 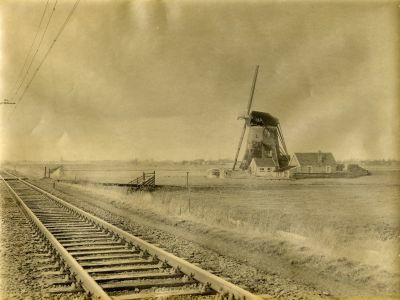 When Heineken acquired the land in the “Groenedijkse polder” in 1971, there was a remarkable windmill. Since 1661 this mill ran the superfluous water from the diked marsh to the Old Rijn. 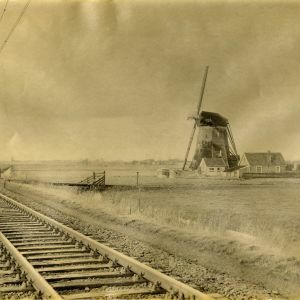 When electrical milling was possible, the mill lost it’s original function and after years of not being used, became property of the Rijnland Mill Foundation. In 1971 Heineken took over the heavily neglected mill. 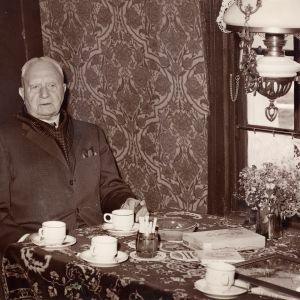 After a thorough restoration, on May 22nd 1975, the mill was dedicated to Leo van Munching , the man who put Heineken on the map in the United States. © Copyright 2019 Heineken Collection Foundation. All rights reserved.